Sometimes it is all about the little things in life...one of them being able to cook/bake with one of your very best friends! I am so excited for this 5th guest post. Although Meghan says she has been having a time with baking cookies lately, she is an excellent baker and especially chef. She inspires me to cook more for myself...to make single girl dinners and enjoy a glass of wine. It was a very sad/happy time when she moved from DC to Birmingham last year, but no matter the distance we will always be friends. We will continue running and pushing each other...having dance parties in the middle of the work day; although in different offices...finishing each other sentences...and discussing life over entire bottles (yes, not bottle) of wine. 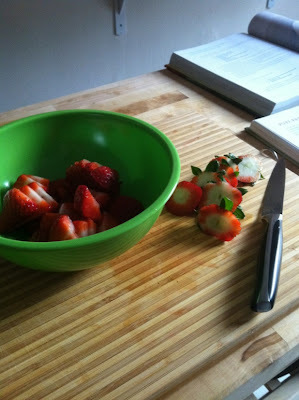 This recipe is going to be amazing and easy so if you like strawberries and balsamic give it a try! As Lauren can tell you, I’m not much of a baker. I’m easily distracted - more likely to guess at measurements than get a measuring spoon dirty, use more cinnamon when I forgot to buy allspice, eat all the dough without making any cookies. Living in Birmingham now, my life moves a little slower. My friends tend to plan gatherings last minute, as they did the day I made this tart. I got the call at 2 to come over for a cookout at 6. Bring something to grill and a dish to share. I had to run some other errands, so I grabbed my favorite new cookbook - Sara Foster’s Southern Table. 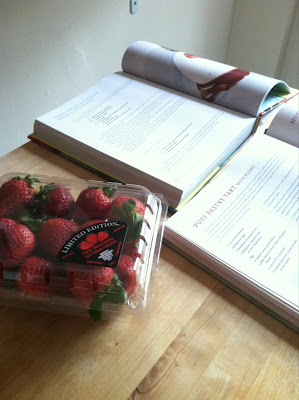 Lauren bought me my first Foster’s Market cookbook, and I still use it all the time. I highly recommend them. The woman who runs the campus farm stand told me to look for strawberries this week, and with spring in full bloom I couldn’t resist them. Sara Foster suggests dousing strawberries in a bit of sugar and aged balsamic vinegar, to bring out their flavor. That was as far as I’d planned when I walked into the Piggly Wiggly. The strawberries were on sale, grouped with the makings of strawberry short cake, but I don’t love the flavor of store bought angel food cake. I’ve been known to make cakes, but with strawberries picked out I only had an hour to get to the party. It was time to cheat a little, and I walked to the frozen food aisle. Every time a food blogger admits to using puff pastry, I decide we can be Internet friends. I don’t care what anybody tells you, making puff pastry is impossible. I’m sure Lauren will master it someday, and I’ll buy mine from her. 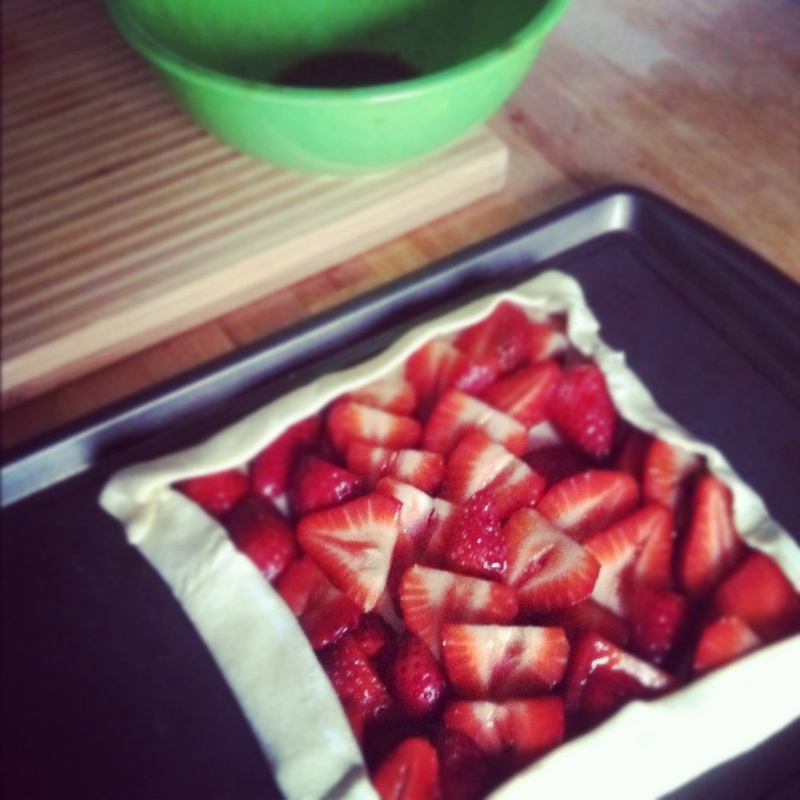 So, a strawberry balsamic tart was assembled and baked in 30 minutes. I didn’t thaw the pastry enough. 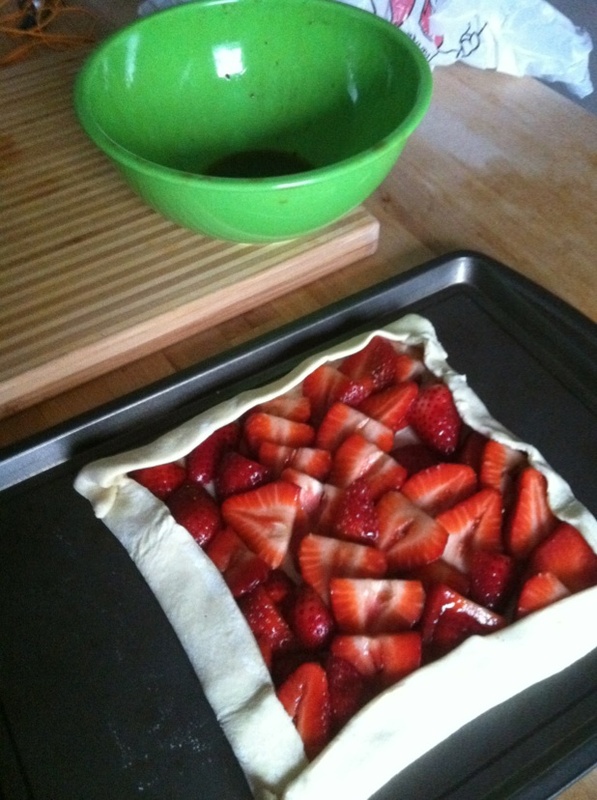 Next time I’ll caramelize the strawberry juice-vinegar to drizzle on top. I’ll buy some mint sprigs. Like a grownup. But this time, with my friend Sarah’s homemade strawberry ice cream on top (the strawberries don’t call out just to me!) it was just fine. That’s my favorite reason to bake - to walk into a gathering of friends with just a little something, as we say in the South. 1. Pre-heat oven to 375. 2. Wash and slice strawberries. 3. In a small bowl, pour balsamic vinegar and sugar over strawberries and stir to coat. Let sit for 10 minutes. 4. Roll out puff pastry. Using a sharp knife, slice through the dough for an inch from each corner (this will make your folds cleaner). 5. Arrange strawberries on pastry, leaving space around the edges. Reserve liquid from bowl. 6. 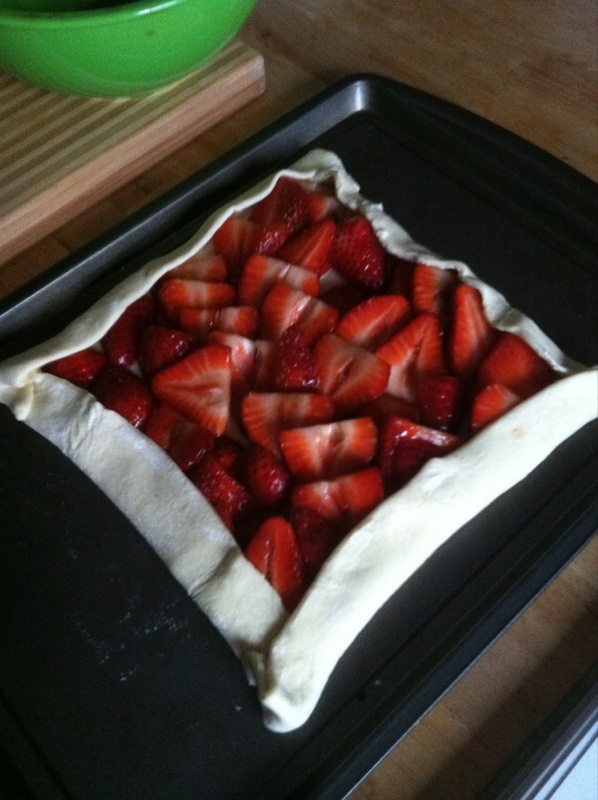 Fold edges of pastry over strawberries. Makes it look less like a pizza. 7. Bake 20 mins, until pastry is golden brown. 8. 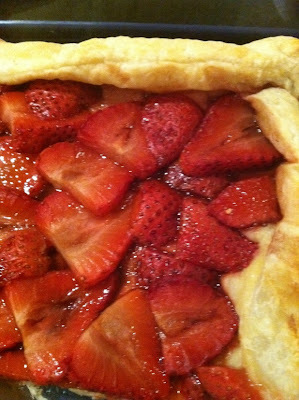 While pastry is baking, reduce reserved strawberry juice over medium heat. It should thicken but not burn. 9. When pastry is cool, drizzle reduction over strawberries and garnish.